Roy S. Bates began coaching in 1938 after graduating from the College of Wooster. 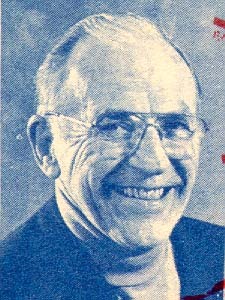 He retired from active coaching in 1966. During the basketball season, you will occasionally find him with the striped shirt, black pants, and the whistle of an official. In basketball, his record is equally impressive. Over 28 years, his teams won 441 games while losing 84, for an 84 percent winning percentage. In this time, he won ten league championships and one state championship (in 1955). The last few years, he has also worked with Bobby Knight from time to time at Indiana University.